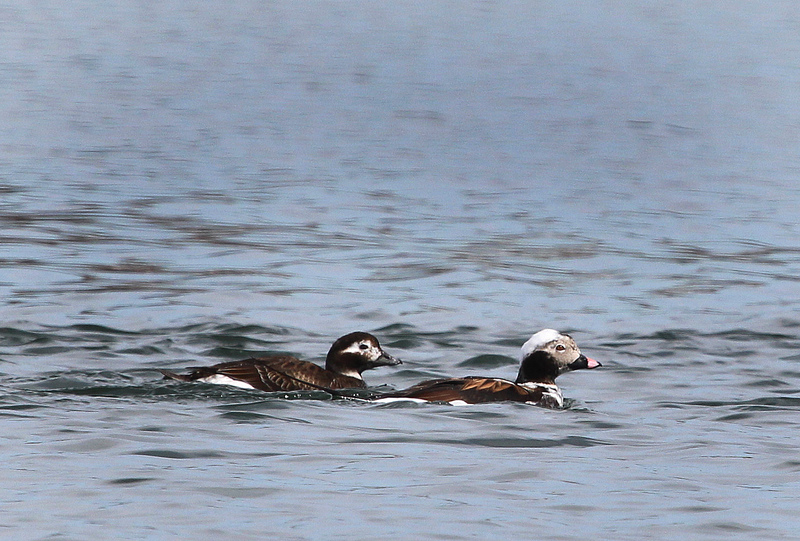 A pair of Long-tailed Ducks in transition plumage swims in Long Island Sound, April 2015. Here’s a shot of a pair of Long-tailed Ducks transitioning from their mostly white winter plumage to their mostly dark summer plumage. Some birds looks the same year-round and some birds look different in the summer and winter. Most ducks (but not all) go through a few different plumages as the year goes on. These Long-tailed Ducks (formerly Oldsquaw) will be heading to their Arctic breeding grounds soon. When they are along coastal New England in the winter, we see their white plumage. It’s one of the few birds, in my opinion anyway, that look more decorated in the winter than in the summer. Take the Common Loon for instance. It sports its famous black-and-white spotted plumage in the summer, but changes to a much more drab grayish plumage in the winter. This entry was posted in Bird plumage, Birding by canoe, Ducks, Long Island Sound and tagged Chris Bosak bird photos, duck plumage, Long Island Sound, long-tailed ducks by Chris Bosak. Bookmark the permalink.